Prayers For Good Fortune Booklet. Eight powerful Prayers to meet these PROBLEMS triumphantly and successfully, to ask That God will Bless you with more “Good Fortune” in Life through your Life-Study Fellowship Way of Prayer. You will also receive a beautiful “Hands of Prayer Pocket Piece”. It is a gift with meaning. 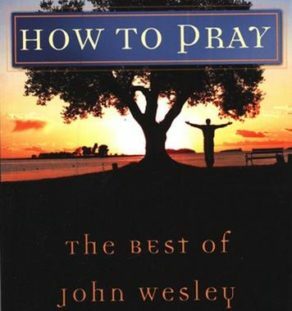 The praying hands are the symbol that all good things come from God. And the message – – “With God All Things are Possible”- – is the wonderful news of hope and faith in our lives. 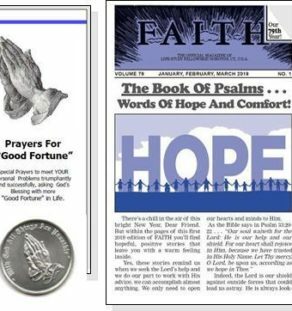 We will send you the latest copy of FAITH Magazine to experience the power of prayer with our three daily prayers… united prayers that you share with Fellowship Friends all over the world. 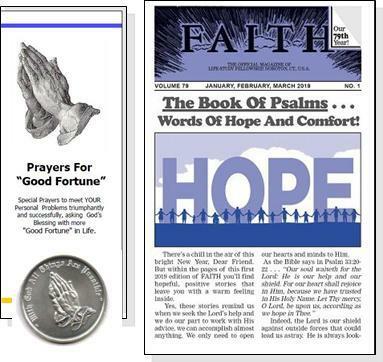 Plus all of the other features that make our FAITH Magazine so special. Your contribution will help cover the cost of postage.